Optional: Cover the top and outsides of the container with paper, first, so you can decorate and color things. Punch 6-10 holes into the lid of the container. 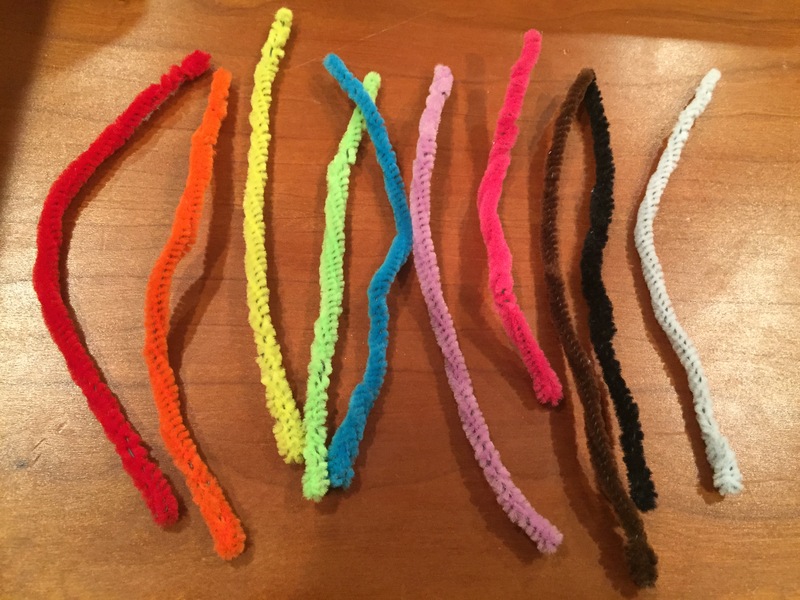 Fold each pipe cleaner in half, then bend bottom centimeter up (so the sharp tips won’t hurt your toddler) and twist the whole thing together tightly. 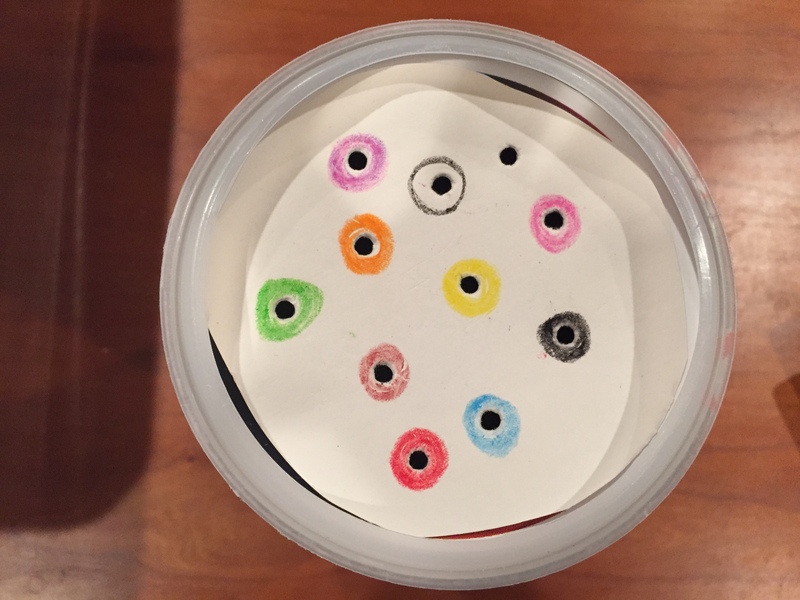 Optional: Color a border around each hole to correspond with pipe cleaner colors so your child can practice matching colors. That’s it! Show your toddler how to push it through. 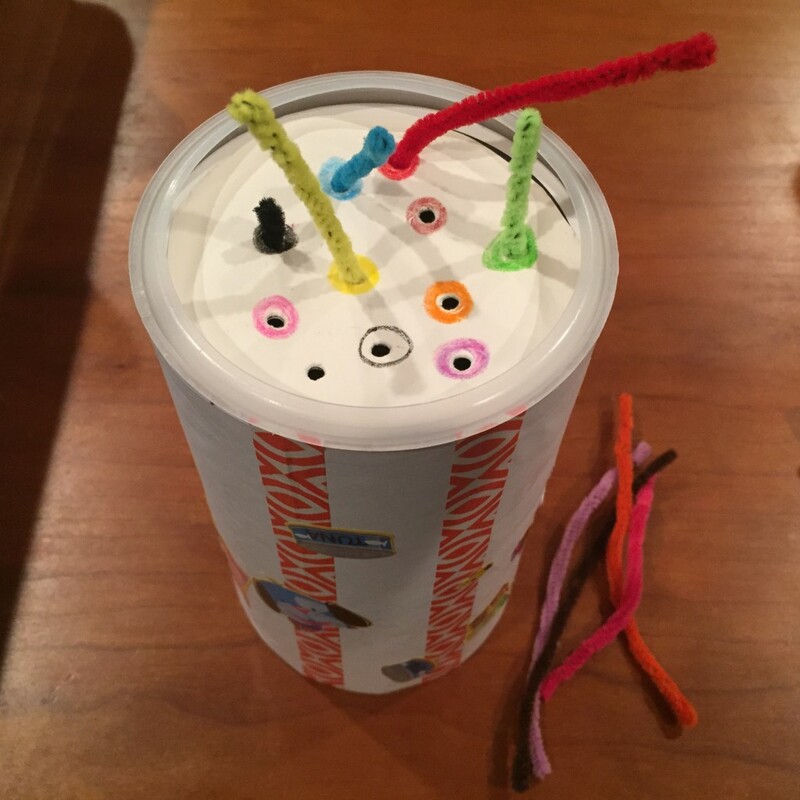 You may have to coach them on how to hold the pipe cleaners closer to the bottom to get the pushing process started. Hmm… I just used a regular hole puncher. I used that for my Pringles container, too, when I did the pom pom holes. Sorry I don’t have other suggestions! Oh goodness, yes, it gets so hard when they’re ready to move on to the next stage. I’ve personally found it difficult to match up craft activities where the components are not easily broken/lost/otherwise ruined, and age level. My issue (and this is totally *my* issue) is that I’m unwilling to spend money and environmental credit on things that will be ultimately thrown away. It makes me sad. 😛 We play with a lot of cardboard boxes, and thankfully, this time around, Elf just wants to do everything his brother does. So the toys from Munchkin’s day get double duty and he’s hitting them a little earlier, I think, because of Munchkin’s example. Yes, we just had some busy box pieces broken today. Note to self, she is not ready for clothespins yet! Haha. Cardboard boxes ALSO happened today. Desperate to entertain her while we get the new room ready! 🙂 I look forward to the day when they can play together! !